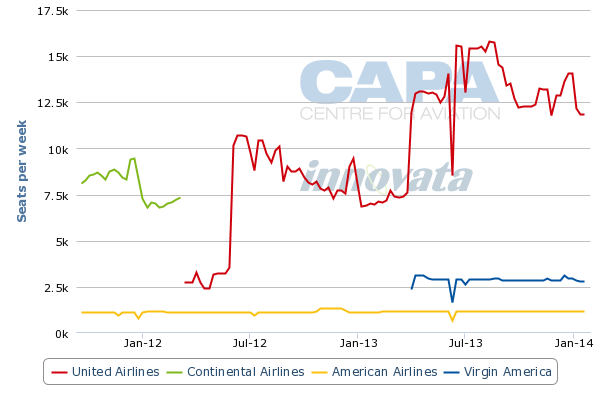 Virgin America leapt out from the red during 2Q2013 to post a second quarterly profit in the company’s five-year history. The swing to profitability is no doubt a relief to the carrier’s management, which appears to be pressing forward with plans to take the company public. The carrier turned a decent performance in operating metrics during 2Q2013 as yields and total unit revenues grew 1% and 7.8%, respectively. Top-line revenues increased 8% while overall expenses grew just 1%, helping Virgin America to reverse an operating loss of USD4.1 million during 2Q2012 and record a USD27.8 million operating profit for 2Q2013. At the same time its unit cost dropped 1.4%. A return to profitability after a long hiatus (it was only profitable in one other quarter – 3Q2010) is a positive development for Virgin America, but a single quarter is far from constituting a trend, and given its consistent string of unprofitability the carrier still has somewhat of an uphill climb to prove it has staying power while building its liquidity. Virgin America still posted a USD37.5 million loss for 1H2013, which is a major improvement over the USD107 million loss for the year prior, but with a balance sheet restructure complete and a decision to put the brakes on growth, perhaps Virgin America finally has some financial stability within its sights. Virgin America’s favourable revenue – an 8% rise in the top line to USD376 million – and cost performance led to a 2Q2013 profit of USD8.8 million versus a USD31.7 million loss a year ago. The carrier also reversed a negative 1.2% operating margin recorded during 2Q2012 to a positive 7.4% a year later. The results, which included USD15 million of positive cash flow, are a significant turnaround for the carrier. However, underlying the nice turnaround was a balance sheet overhaul executed by Virgin America during 2Q2013 that entailed the wiping out of USD300 million in debt and accrued interest, and the securing of USD75 million in debt financing. Scant details of the debt extinguishment are available since Virgin America remains privately held, but the relief no doubt helped the carrier focus more clearly on improving revenue and pricing traction. While most US carriers battled softening yields during 2Q2013 and Virgin America’s average fare fell 1.3% to USD197, the carrier managed to charge more than JetBlue, who posted an average fare of USD157 during the quarter, and Southwest, whose average fare was USD151. Virgin America’s capacity remained flat year-on-year during 2Q2013 as the carrier has taken a hiatus from aircraft deliveries after adding 24 Airbus narrowbodies to its fleet between 2Q2010 and 2Q2012. It has cancelled orders for 20 current generation Airbus narrowbodies and deferred deliveries of 30 A320neos. After taking delivery of a single aircraft during 1Q2013, Virgin America’s fleet will remain at a steady state of 53 jets until 2015. Keeping its capacity flat helped Virgin America growth its traffic by 5.6% year-on-year during 2Q2013 and increase its load factor by 4ppts to nearly 84%. The carrier also kept a lid on costs during the quarter as unit costs excluding fuel fell 1.4%. Although its unit costs for 1H2013 increased 4.5% to USD6.97 cents, Virgin America’s overall unit costs were still lower than its low-cost and hybrid peers Alaska Air Group, Virgin America, JetBlue and Hawaiian. Alaska, which posted 1H2013 unit costs of USD8.46 cents, has repeatedly stated that it needs to get its cost in line with those other carriers. Virgin America has stepped up competition with Alaska in recent years on flights from Portland to Los Angeles and San Francisco and the crowded Los Angeles-San Jose market, which is likely one factor in Alaska’s efforts to get its unit cost more in line with its peers. A highlight for Virgin America during 2Q2013 was finally launching service from Newark Liberty international to round out its footprint in the New York metropolitan area. After reaching a deal with American to lease slots that carrier held at Newark, Virgin America introduced new flights from San Francisco and Los Angeles to United’s Newark fortress in Apr-2013. Prior to Virgin America’s entry into the San Francisco-Newark market, United held a monopoly on the pairing, joining its US east coast hub with its hub on the west coast. Virgin America ruffled United’s feathers as United cited revenue pressure as Virgin America’s entry into the Newark market resulted in a 20% drop in fares on the routes served by its smaller rival. United responded with its own significant capacity increase on the new Virgin America routes, which resulted in the number of one-way seats deployed between Newark and San Francisco growing from roughly 14,516 on 31-Mar-2013 to approximately 19,667 on 4-Aug-2013. The number of seats in the Newark-Los Angeles market increased from about 11,929 to 19,298 in the same time period. Virgin America hinted that it is holding its own in those markets, noting that after three months operations the three daily flights in each Newark market, the routes are performing ahead of its forecast, and that it is achieving a revenue share in excess of its capacity in both those markets. 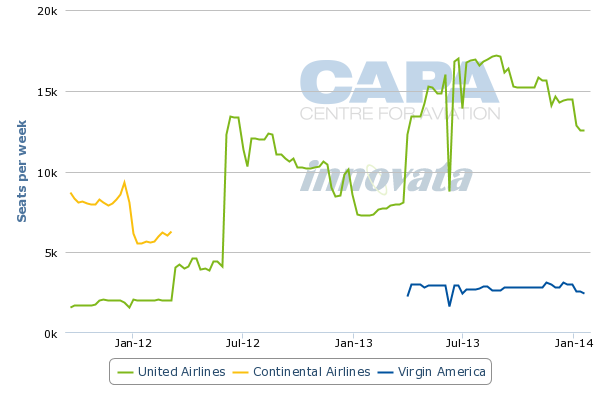 The carrier added it was seeing “early signs of profitability” on those routes, which is interesting given the start-up costs and promotional pricing offered by Virgin America in the markets, which at one point after sales commenced was USD149 one way. But it could be plausible that the start-up costs were manageable given Virgin America’s high profile in San Francisco (which is its largest base – based on seats deployed– and headquarters) and Los Angeles (its second largest base). With brand awareness in those markets and in the New York area (Virgin America has served JFK since its 2007 launch), perhaps the marketing spend was slightly less than other route launches. While Virgin America’s comments regarding Newark are interesting and add intrigue to the competitive dynamics on the routes it serves from the airport, the interpretations for “early signs” of profitability are broad, so those comments need to be looked upon with some caution. Three months is a short period of operation, and with so much flux in the markets served by Virgin America from Newark, the carrier needs to sustain those sparks of potential profitability for a bit longer. Another step Virgin America took during 2Q2013 to drum up its liquidity was a USD75 million debt offering, which lifted its unrestricted cash balance to USD148 million compared with a cash balance of USD58 million at the end of 1Q2013. Its current cash balances are just USD12 million shy of the carrier’s highest balance of USD160 million at the end of 4Q2011. While that is still not a significant amount of cash to have on hand, it is a marked improvement on the USD26 million cash balance posted by the carrier at the end of 4Q2012. 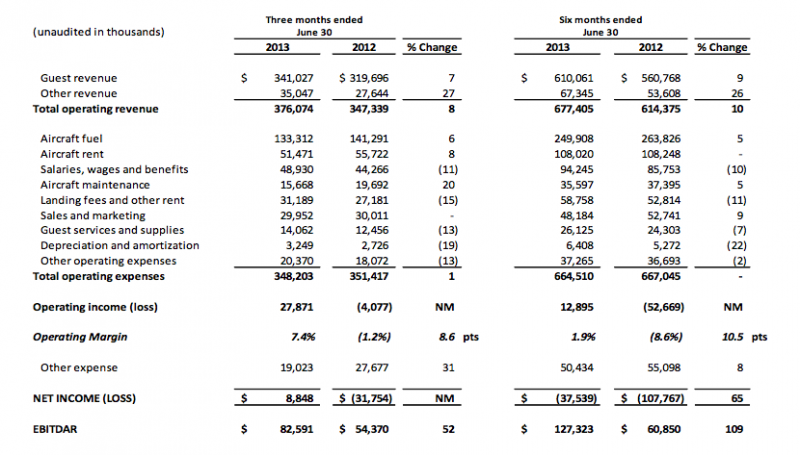 Virgin America’s 2Q2013 results show much promise after years of disappointing financial reports. If the carrier can turn a profit during 3Q2013, which includes the busy summer high season in the US, perhaps it will be a sign it can keep the nascent positive momentum heading in the right direction. But it should be cautious in its efforts to go public, as would-be investors need to see a string of consistent annual profits before fully endorsing the carrier’s business model.